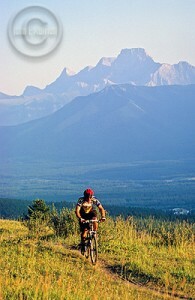 Cycle through the scenic Jasper, Alberta wilderness. JASPER, Alberta – Last weekend I decided to check out the best mountain biking trails in the Jasper National Park area of the Canadian Rockies. I packed up a lunch and headed over to rent a front suspension mountain bike from Freewheel Cycle Jasper. Everyone in the shop was super knowledgeable and gave me some great advice about what to see before setting out on the trails. It’s been awhile since the last time I went biking in Jasper, so I wanted to brush up on the trail markers before setting out. I talked to Chris at Freewheel cycle before embarking on my journey and he had some great recommendations. According to Chris, “The bike paths in Jasper are all trails, if that is one thing we are lacking it is paved pathways.” Sounded great to me, I couldn’t wait to get off the pavement and into the Canadian Rockies wilderness. Chris had some great trail recommendations too. For a nice steady grade that won’t kill your cycling legs, he recommended Pyramid Bench. “It runs just out of town on a new beautifully cut, wide and gravel trail that is great for all bikers.” I decided to check out the Saturday Night Lake Loop also nicknamed the 20 mile trail (it only feels like 20 miles, you don’t have to hoof it that far). Chris was right, it was “epic, isolated, and way out there in the back country.” I have to admit, I was a bit sore after a full day of biking, but sightseeing from a mountain bike was definitely worth it. No pain, no scenic-views-and-stunning-scenery gain.